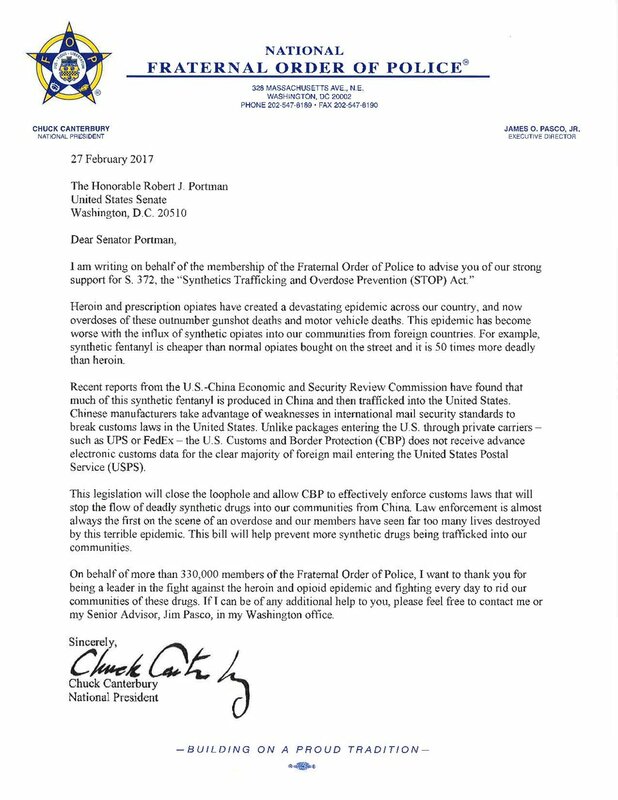 Washington, D.C. – As members of the Trump administration and congressional leaders prepare to host a summit on solutions to the nationwide opioid today, Americans for Securing All Packages urges all elected officials in Washington to support closing a major security gap in the postal system that helps fuel the health crisis. While packages sent through private carriers must include advanced electronic data (AED) used by law enforcement to screen and stop dangerous material, including deadly drugs such as fentanyl, packages shipped via foreign postal services do not require the same information. A new bipartisan report from the United States Senate Homeland Security Permanent Subcommittee on Investigations (PSI) found that only 36 percent of foreign packages delivered by the USPS include AED, and that the limited data provided is too low quality to be useful, meaning over 1.36 million unscreened and potentially dangerous packages enter the country every day. As a result, the report found that online drug traffickers prefer and recommend the use of the postal system for shipping synthetic opioids and other illegal drugs into the country. The Synthetics Trafficking and Overdose Prevention (STOP Act) would help close the drug pipeline by requiring AED on all foreign packages entering the country, including those delivered by the USPS. The STOP Act currently has 30 co-sponsors in the Senate and 252 co-sponsors in the House of Representatives, and is endorsed by those on the front lines of the opioid crisis, including the Fraternal Order of Police, the American Medical Association and the National Conference of State Legislatures. The President’s Commission on Combating Drug Addiction and the Opioid Crisis also called for the bill’s passage in its final report.